for April 1970 with comparisons with April 1969 are shown on table 1.
average daily delivery per producer for individual markets are shown on table 4.
decreased 1.8 percent from last year, to a total of 3.2 billion pounds for March 1970.
totaled 9.5 billion pounds, 0.9 percent below such Class I use during the same period in 1969.
fluid sales for January and February 1969. Sales were up for most skim milk items. show the largest increases, increasing 19.8 percent and 15.9 percent, respectively. Federal order markets during January, February, and March are presented on table 13. SCorrection: Neosho Valley Class I price for March $6.28 and Wichita $6.43. Generally the major city in the marketing area. See footnotes on table 2 for location. 1/ 201-210 mile zone: April 1970, $7.16 and April 1969, $6.91. 3/ Excludes an 8-cent direct delivery differential. March 1969, $5.58. 2/ March 1970, blend price includes approximately 42.8 cents to nearby And intermediate producers. West Virginia. 8/ Bristol, Tennessee.- 9/ Miami. Class IV price $3.11. 10/ Jacksonville and Tallahassee 11/ Traverse City. cheese. 16/ Zone II (Marquette). 17/ Weighted average of all handlers' blend prices at all locations. 18/ Zone I. 19/ Indianapolis. 20/ Base zone. 21/ Peoria. 22/ Sioux Falls. 23/ Rapid City, South Dakota. 24/ Zone I (Waterloo). 2T/ Weighted average of all hantlersr blend price;. 26/ Rock Islan, Illinois. 27/ Base zone (Fargo). 28/ Zone I (St. Louis). 29/ Kansas City and Topeka. 30/ Pittsburg, Kansas. IT/ Gulfport. Class I and blnd price at Jackson and Greenville 16 less. Texas. 37/ AmarTllo. 38/ Monroe and Shreveport. 397-Zone I (Dallas). 40/ Abilene. Class II-A (Cheddar cheeseT $4.13. 41/ Zone I-New Braunfels, Texas. 42/ Class II-A (ieddar cheese) $4.14. 43/ Mercedes. 44/ Houston. 45/ Denver. skim milk transferred or diverted as Class II milk to a nonpool plant outside the marketing area. 51/ District I (Seattle). 52/ Spokane, Washington. 53/ Portland. TABLE 3.-FEDERAL ORDER MINIMUM CLASS I AND BLEND PRICES-FOR MILK OF 3.5 PERCENT BUTTERFAT CONTENT, F.O.B. 1 See footnotes on table 2 for location at which price is reported. 2 Markets under regulation on January 1, 1969, and which have had no significant marketing area expansions. Btxludes Minneapolis-St. Paul, Southeastern Minnesota-Eorthern Iowa, Georgia, and Oregon-Washington. St. Paul, Southeastern Minnesota-Northern Iowa, Georgia, and Oregon-Washington. 21 May include some duplication due to intermarket transfer. L/ Markets under regulation on January 1, 1969, and which have had no significant marketing area expansions. Excludes Minneapolis-St. Paul, Southeastern Minnesota-Northern Iowa, Georgia, and Oregon-Washington. Table 7.--Federal milk order Class I formula price information, March 1970 -Con. .. .... ........ .. .... .....NT- I .. I.. . 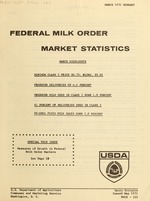 DEFINED BY FEDERAL MILK ORDERS FOR MARKETS WHERE SUCH INFORMATION IS AVAILABLE, FEBRUARY 1970 WITH COMPARISONS -CON. S/ Small amount of sales estimated. I/ See table 8 for markets included. Dollars per 100 lb. : Dollars per 100 lb. l/ See footnotes on table 2 for location at which price is reported. Dol per 100 lb. :: ol. per 100 lb. Oregon-Washington, Red River Valley, San Antonio, Southern Illinois, Tampa Bay, Tri-State, and Upper Chesapeake Nay. h 92-Score : 93(92)-Score :: 92-Score : 92-Score i/ 93-Score :: ::. May : : : : : : ::. (nonfat dry milk, spray, Chicago area plant price times 8.2) less 48 cents. wholesale 2/ grade milk 2/ ""
Preliminary. ** Based on partially revised data. Converted by using Chicago 92-score butter times 0.120. 3.5% price as reported in the "Fluid Milk and Cream Report," SRS. "Milk Prices Paid by Creameries and Cheese Plants," SRS. "Evaporated, Condensed and Dry Milk," SRS. lb. : Pct. i lb : Pct. : il. l ct : P. :Mil. lb. : Pct. Million pounds : Pct. Million pounds : Pet. Million pounds : Pct. 1 000 b. 1.000 l. 1000 b. bl. Nil lb. :Number : 1,000 : Number : Number : Million pounds Percent Dol. per 100 lb. Percent : Pounds : Dollars : 1,000 del. 2/ End of year. 1951-59 and 1960-69 according to 1950 and 1960 U. S. census, respectively. 4/ Prices are simple averages for 1947-61 and weighted averages for 1962-69.
sales in the marketing area. for manufacturing use to any milk plant, including an other order plant. incentive payment plan (Louisville plan) provisions from the Central Arizona order. supply-demand adjustor to the Class I price from the Nashville order.